The technological advancement of the Nordic region isn’t something to argue about. In the last edition of the Digital Evolution Index, 4 out of 5 top places were taken by Norway, Denmark, Sweden and Finland. And it’s not only because of the multi-billion dollar companies like Spotify. Small and medium-sized enterprises representing various branches are also investing in new technologies, developing web and mobile apps to enhance their client base. And it’s already a problem for the Nordic companies. 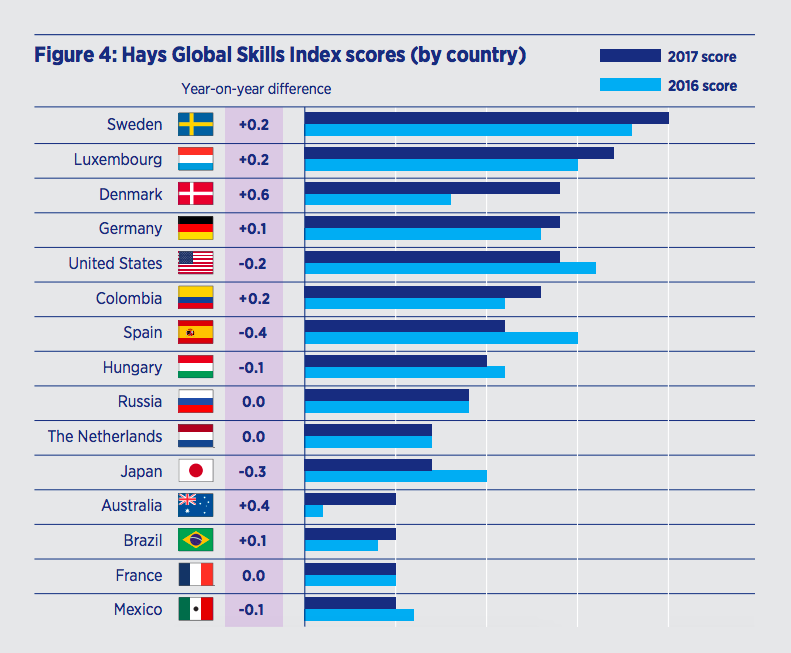 Among all the countries in the Hays Global Skill Index 2017, Sweden has the highest level of labour market stress. And Denmark, which was in a slightly better situation year before, is almost catching up now. What does it mean exactly? The biggest problem for both countries is the so-called talent mismatch. To quote the report, “businesses face serious difficulty in matching available talent with unfilled jobs”. It’s especially visible on the software development market. Danish government predicts that the country will come short of 19,000 IT specialists by 2030 and, according to the Finnish Information Processing Association, Finland will be lacking 15,000 IT engineers by 2020. Of course, it’s good news for the software developers, as they can demand more from their employers, not only in terms of salary but also additional benefits and work-life balance. The rising demands of software engineers can be satisfied by global tech moguls, like Microsoft, IBM and Uber, which are currently expanding in the Nordics. But what about smaller players? Without the proper workforce, small and medium enterprises won’t be able to scale up their businesses. They can, of course, wait for governments to improve the education system, but it’s a process which will take at least a few years. It’s also possible to create training programmes and, for example, teach immigrants to code. In fact, as Daxx informs in its report, some companies, like Integrify, have already started such projects. Unfortunately, this way you can only fill junior-level positions (and it still takes a few months). All in all, more and more Nordic companies realise that, in the present situation, the best decision is to outsource. Lucky for them, the world of outsourcing has recently changed a lot. Changed for the better. Why exactly? Because a new opportunity appeared. Nordic companies have recently realised that, instead of employing remote workers from offshore countries like India, they can outsource to their neighbours in Central and Eastern Europe — and this is pretty much the definition of “nearshoring”. Why is it such a hot topic recently? What are the benefits of nearshoring? Many experts talk about geographic proximity: when outsourcing to Poland or Ukraine, you don’t need to google “time difference between…” every other day, as the difference is 1 hour or nothing at all. Other outsourcing experts focus not only on geographical but also on more elusive aspects — according to them, it’s easier to work with people when there are cultural, social and political linkages. This is all true, but when it comes to software outsourcing, there are things which matter even more than geographic or cultural proximity. The most important one, which you want to check before starting any collaboration in the IT world, is the technological proficiency of the developers. Fortunately, thanks to the magic of the internet, we can compare IT engineers from various countries. 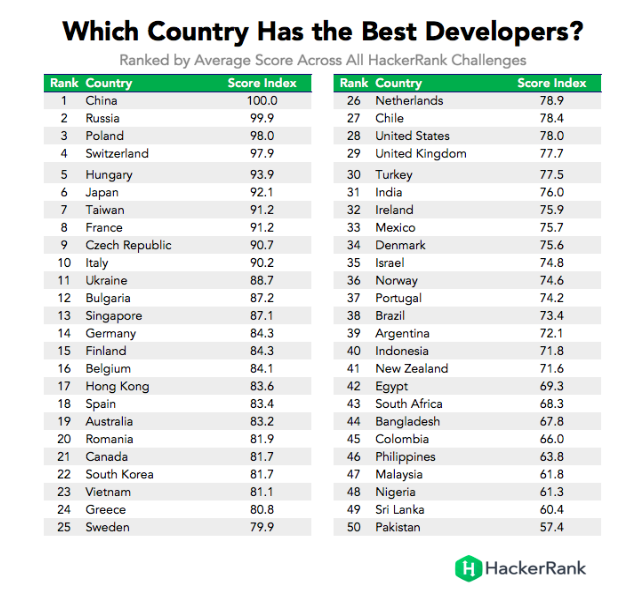 And, according to the extensive report by Hacker Rank, developers from CEE are among the very best ones, with Poland securing the 3rd place — outscoring not only India but also United States, Japan and all of the Nordic countries. However, everyone who has worked in IT for some time knows that high-quality code is not enough. Following the principles of agile software development, you want to contact the remote development team almost on a daily basis. And to do that, you need them to be communicative and to know English very well. 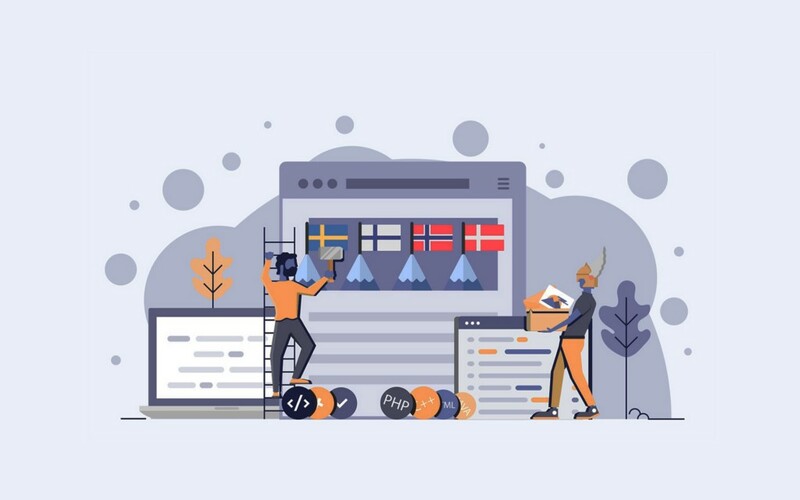 It’s especially important for Nordic companies, as Sweden, Denmark, Norway and Finland are among the very best English-speaking countries in the world, according to the EF English Proficiency Index ranking. And this is why Nordic companies want to outsource to Central and Eastern Europe — in the English Proficiency Index ranking, Poland secures the 11th place in the world. Just to compare, India is 27th and China 36th. All in all, the nearshoring revolution brought IT outsourcing to the next level. 5 or 10 years ago, software companies outsourced their processes when they needed simple, straightforward body leasing. A fairly easy, repetitive job was done by remote workers while the most important lines of code were still written in-house. Nowadays, as Nordic countries experience lack of software engineers on the market, things are different. Simple body leasing is not enough. When outsourcing, modern software companies need complete teams of IT experts which can understand their business and perform the tasks at least as good as the local developers. Let’s talk numbers. 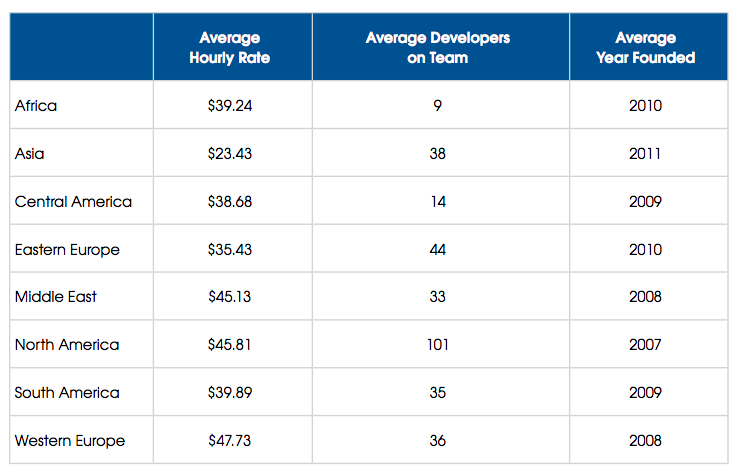 Recently, Daxx has prepared an up-to-date list of average software developer salaries. In Norway and Denmark, it’s circa $70,000 (or €60,000) per year, in Sweden and in Finland — respectively $53,000 (€45,000) and $47,000 (€40,000). When we look at the data gathered by PayScale, the numbers are almost identical. And the conclusion is the same: all four countries are among the highest paying in the world. What about Central and Eastern Europe? Average software developer in Poland earns $24,000 (€20,000) per year. Therefore, it’s half the salary of a Finnish developer and one-third of a Norwegian developer’s paycheck. Makes you think, doesn’t it? However, it’s still only an average salary of a software developer — and you probably aren’t planning to open a new office in Poland anyway soon. When talking about outsourcing, it’s best to focus on the average cost of a software developer in an outsourcing company. Preferably, an average hourly rate — and this is exactly what we can find in the recent report prepared by SourceSeek. An average hourly cost of a software developer in a software house in Eastern Europe is circa $35 (or €30), which is 25% less than in similar companies in Western Europe. And that’s not everything! A typical software company in Eastern Europe was founded in 2010, almost a decade ago, which means one thing: besides outsourcing itself, you can also get their know-how. With the average number of working hours, as well as the total paid leave, being almost the same for all aforementioned countries, you must realise one thing: Nordic companies which decided to outsource to CEE simply did their math. You can get a team of world-class developers and pay for them the fraction of what you used to pay locally. Too good to be true? Well, many people still think so. Some are worried that they will lose control over the remote team. Others don’t believe that outsourcing can be a long-term solution. But you know what’s the best? That nowadays there’s no use of worrying, as you can check everything on your own. There are independent research companies, like Clutch, which gather reviews on software development teams around the world. Do a little research and check out what previous clients think about a certain software house. Find out if they have: good project managers supervising the developers, experience in long-term projects and experience in the technology of your choice. Everything checked? Then open up a new email window and start writing an enquiry. It seems that you may be the next entrepreneur wishing to benefit from nearshoring. The article was written by Marcin Mazurek and was first published on The Software House Blog. Visit the blog for more articles on software outsourcing tips and best development practices. The State of Nordic IT Outsourcing was originally published in Hacker Noon on Medium, where people are continuing the conversation by highlighting and responding to this story.